I woke to the sound of the sea smashing onto the rocks. Good, I thought. I love it when there’s a thundering sea running. Up early to take my husband for minor surgery, I went to the cliff edge to see the white foam breaking over the rocks, and looked out to the horizon. The sun was just rising, a flaming red band above the sea, fading to amber, and then to palest turquoise, the few clouds black in the pearly lightening sky. Still. Not a breath of wind in spite of the pounding waves. Leaving the old chap to the anaesthetic and the knife, I searched for a cafe open at 7.30 to have some breakfast, and decided that Eggs Benedict would help to while away the two hours until I fetched him. But by the time I’d picked up the invalid and driven back home with my wonky liver making its grumpy presence known, I realised that Eggs Benedict that early in the day was not a good idea. Later the morning soared into joy with a long phone call from eldest grandson, completing a double degree in arts and science at Uni. By the time we’d debated GM experimentation and the environment, knocked off Schopenhauer and his will to live, breezed through Nietzsche, explored his theory of the nature of pain, tried to define happiness a propos Nietzsche and his fulfilment of will, covered the architecture of Paris, categorised various behaviours as schizoid, narcissistic etc, explored Maslow’s concept of peak experiences, agreed on beauty, argued about the number of different species of birds, butterflies and animals, discussed his fitness regime and the nuances of rock climbing, I felt as though my brain had had its own peak experience and a mental workout as well. I put down the phone smiling like a Cheshire cat. Nothing – not even a peak experience – beats talking to my grandchildren. Lunch was a breeze, as a neighbour had dropped in some hot savoury scones and cheese turnovers, so I didn’t have to cook. I replenished the bird’s various feeding bowls with wheat, and then tooled back into town to the surgeon for the invalid’s dressing to be changed, and various instructions for his care. At the chemist, picking up the prescriptions to administer, I was greeted warmly by another customer, a youngish woman in a huge multi-coloured caftan to disguise her weight, and only one arm. As her joyful goodness enveloped me, I felt ashamed of my livery grumpiness. Stopping at the village shop for milk on the way home I found a parcel waiting for me. It was ‘Carolina Cavalier’, the biography of James Johnston Pettigrew, the other General who led Pickett’s Charge at Gettysburg. One of his descendants, a dear friend, had sent it, knowing my fascination for the Civil War. Early to bed, too tired to start my new book – I just needed some mental knitting – so skipped happily through a Georgette Heyer. Before putting out the light, and opening the window wide so that the sound of the sea would fill the room and all the spaces of the night, I thought about that phrase, a good enough day… and remembered that old legend about the poor man who had a horse he treasured. One day it disappeared, and all the villagers commiserated with him about his bad luck. But he brushed aside their sympathy saying it wasn’t good and it wasn’t bad. A few days later the horse re-appeared bringing with him a herd of wild horses. Everyone congratulated the old man on his good fortune, but he again brushed it off, saying it was neither good nor bad. His son began breaking in the horses, so that they could sell them, but one day he was thrown, and broke his leg. More commiserating moans from the villagers, and once more the old man shrugged and refused to judge what had happened. While the son was laid up, the king levied a call on all young men to join the army to fight for their country. How lucky you are that your son can’t go, exclaimed the villagers. And the old man made no comment again. He never judged anything that happened, recognising that he actually never knew whether what happened was fortunate or unfortunate. Life just is. So I looked back on another daily round filled with common tasks, which furnished all we ought to ask, in the words of the hymn, and there were unexpected gifts as well as the expected challenges. I don’t know what the hidden significance of any of it is… maybe one day I will. Maybe I will never know. Maybe I will know when I reach the other side. It was simply another good enough day. Neither good nor bad. The stuff of life. I have people coming for dinner on Sunday. It started out as four of us, but visiting overseas mutual friends, means that we’re now eight. So I’ve decided to haul a small turkey out of the deep freeze. I’m also going to Benjamin Britten’s War Requiem in Auckland on Saturday night with my daughter, and a party afterwards, and know I won’t be as on the ball on Sunday as I’d like to be. So I cooked the pudding today and it will reheat perfectly. Because it’s a sort of Christmas turkey, I thought I’d do one Christmassy- type pudding, and one refresher – a lemon cream. The Christmassy option is apple crumble, the stewed apple mixed with Christmas mincemeat. It lifts apple crumble into another realm, especially with a little brandy added to the apple- mincemeat mixture, and the crumble a really rich one. For the crumble – a big one – I used ten ounces of flour, and two of ground almonds, six ounces of butter and eight ounces of sugar, plus grated lemon rind. Mix the butter into the flour, add the rest of the ingredients, tip over the fruit in an ovenproof dish, and bake for forty minutes or so in a medium to hot oven. It will wait in the fridge, and re-heat on the day. I’ll serve it with crème fraiche. Perfect. A good enough day here. Thank you! Great! so glad it’s a good enough one – hope they all are!!! I love your conversation with your grandson. It sounds like you have a wonderful relationship (he’s lucky to have such a fun, intelligent grandmother!). Best wishes and quick healing to your husband! Yes, my grandson really is the apple of my eye… we’ve had such fun over the years… and the others are also lovely apples too!!!!! Thank you for your good wishes for my husband, Kathie… he’s doing fine now…so glad you enjoyed the post, and yes, in the end, it’s always our children and grand children who make the difference in our lives, isn’t it ! Thank you for sharing the Food for Thought. Best wishes to your husband’s recovery! Beautiful flower pot, love the blue! Hello Amy, thanks for your good wishes,,, hes doing fine. 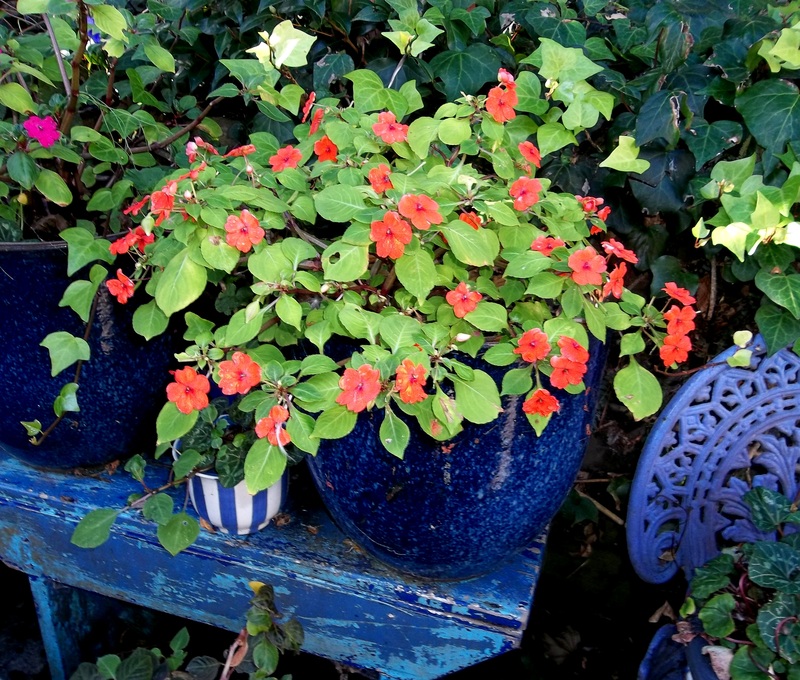 So glad you resonated with Eckhart Tolle’s words, and my blue pot!!! What a beautiful good enough day and a pleasant read. Hope your husband recovers soon. Thank you, friend, for your good wishes, hedoing fine now… and glad you enjoyed the post. – have a good enough day for yourself ! i think we pick on the experiences that pick on us, due to our personality, or even the way we feel that moment. We seem to have a tunnel vision like interest, in events around us, to choose and pick, and to fail to see what we’re not interested in. Nice reading your work Valerie. Thank you George – glad you’re enjoying the posts! You’re so right about not seeing the things we’re not interested in ! have a good enough day, won’t you…. I haven’t read Georgette Heyer for years but describing it as mental knitting made me laugh. And I am so happy someone else does the mixing fruit mince with apple trick. It was always my mother’s favourite way to use up the leftover Christmas mincemeat. I expect you will be enjoying the War Requiem as I write this. Have a happy good enough weekend. Loved your comments…I found the mincemeat apple crumble recipe in a Robert Carrier column in the Sunday Times in England fifty years ago! Things just keep on going around! Thank you, It certainly was a good enough weekend, and the Requiem was a profound and moving experience. Hope you have a happy good enough week! Thank you. And I am hoping for a good enough week too. Very nice. I miss the sound of the sea in San Francisco. My favorite sea sounds where there. I always visualise Sweden with lots of snow and pine trees… any round you? when the wind soughs through them, they sound just like the sea…. Your grandson could make a living as a phone conversationalist! And rent himself out to small dinner and cocktail parties, academic events, book signings, museum openings, art openings, poetry readings and lectures. Actually, the two of you could do it together: bring along a large pot of soup and you guys could make a fortune! He is something isn’t he… but actually an introvert… Apart from his brother- I think – I’m the only one he talks to like this…..I do remember them both lolling on my sofa for three hours one night debating the nature of ‘good”… I went to bed with my heart singing…. I can never spell lieutenant properly either..( but I’m going to be promoted to captain shortly, so you won’t have to struggle!!!). and I wish I knew how to activate my spell check, or find it!!!! What a wise and beautiful way of viewing life. I love the story of the old man and his horse. To think that way is a sure way of avoiding pain and misery. Take everything as it is without judgement…..
Only remember the lesson you have learnt from it and discard the rest. Thank you Valerie for yet another enlightening post . Wishing your husband a speedy recovery. So lovely to hear from you again, Veronique, and I’m so glad you’re back on air with your blog… thank you, my husband is going on fine now… amazing at 84!!!! I loved your story of the poor man and his horse. When I worked in Human Resources I always told people, “one door closes and another opens.” It’s so true that you can’t determine whether something happening is good in the big picture until much further down the road. Sometimes the new door is so much better than the old one! You’re so right, and yet it’s easy to forget in the press of everyday life, as we get stuck behind a slow moving truck or get home and find we’ve broken half the eggs!!!! Then its nil desperandum, and grin anyway… take what comes!!!! It is so easy to fall into grumbles when you start judging your/my day…but like the story each day is neither good nor bad it just is. Thank you for the post and the quote…thought for me to remember! Hello LInda… can’t imagine you grumbling! glad you enjoyed it – and Eckhart Tolle – wonderful writer isn’t he…. A good enough life indeed Valerie! You sound like a very interesting Grandma to have – how wonderful to have those rich conversations. Thanks always for your words. And thank you for reading them, Michele – I can tell you that being a grannie is the most wonderful experience of unconditional love… I don’t know a grannie who doesn’t feel this way!!! Your “good enough” day was a delight. Every detail was calmly rich! Hello Marylin – good to hear from you. So glad you enjoyed the post,thank you – have a good enough day yourself !! Unjudged…well, that’s not true. If I found that apple crumble cooling on a window ledge, I’m not sure how quickly I’d turn criminal! Love your writing, Valerie. I weave and zag so willingly as you segue into broader themes and bring us back. I so agree with the quote from Tolle. He and his wife have a home on my island. Well, they may have sold it by now. It’s not convenient to be a travelling soul while living here. It’s a great resting place for a traveling soul, but connections are a challenge. Hope the Civil War doesn’t take you away for long! I’d love to share the apple crumble with you Amy… it disappeared quite fast the other night! Thank you for your kind words about my writing Amy, I love to know you read it!! There is always so much food for thought in your posts -I love coming to them. We love our ‘conversations’ with our 4 year old Grandson and come away grinning! I can just imagine your delight with the conversation you describe. I once had a friend who used the term ‘good enough’ and I have begun to take it on board. I’ve always been a bit of a perfectionist but life is much happier with ‘good enough’. I wish your husband all the best with his minor op and you all the best in your multi tasking! Hello Sally, always so good to hear from you… I envy you still having little grand children to cuddle…and knit for – mine are all well over six feet, apart from my beautiful grand-daughter. Thank you for your best wishes for my husband.. he’s coming along, – and hope you enjoy the crumble mix… I’ve actually decided not to put as much almond in again – I rather like the solidness of a real crumble! Thank you so much for your comments… good to hear from you… yes, other people’s goodness Is contagious, thank goodness – you’re so right ! But your words describing how you woke to hear the sound of the sea and then walking onto the rocks were fabulous – I could hear and see it all with you, thank you! Thank you Claire – lovely to hear from you… you have the sea at your shoulder too, don’t you? It’s one of the things about blogging that we get to vicariously savour each other’s lives – and gardens – isn’t it! Yes I’m about 1–m away from the sea, with several roads inbetween but there are days when I hear it crashing and thumping on the shore – a wonderful sound so when I read your words I was there with you! Delightful, delightful. I savored every word that brimmed with joie de vivre! It was like lying on the beach and holding a truly relaxing book, being transported into some place where everything seemed right. You must, you must, put these words into the pages of a book, for others to savor, as I have. Totally enjoyable. Dee, thank you so much for your lovely enthusiasm… so glad you enjoyed the post… you are such a wonderful blogger friend! I’m so glad we swim in the same shoal !!!! Thank you so much for reading the blog and commenting… and thank you for your good wishes about my husband.he’s doing fine..
Good to hear from you, but when I went to your gravatar I couldn’t find a blog – do you???? What an inspiring post, thank you – and all from thoughts about something being ‘good enough’! That seems such a paradox, but it is so true. the sound of the sea, the scent of the turkey baking, the wonderment of a long phone conversation with your grandson the beautiful story, and your wonderful philosophy. Thank you for sharing your skills with us. So today will be a good enough day in Morristown, too! This was such a beautiful comment Ronnie. it felt like being handed a bouquet..Thank you so much for your lovely thoughts- and what poetic words. wonderful, descriptive, lively writing—-so real and free flowing! thank you!